Beautifully engraved certificate from the Lehigh Valley Terminal Railway Company issued in 1891. 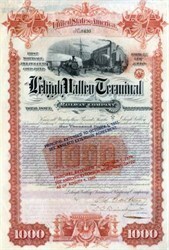 This historic document was printed by the New York Banknote Company and has an ornate border around it with a vignette of Lehigh Valley Railway Terminal. This item is hand signed by the Company’s Vice-President and Secretary and is over 110 years old. In 1890, by a consolidation of several subsidiary organizations, a corporation having the name of the Lehigh Valley Railway Company, distinct from the Lehigh Valley Railroad Company, was formed, which opened a new line of rails to Buffalo in September, 1892. In 1891, the Lehigh Valley Railway Company had leased this line to the Lehigh Valley Railroad Company for 999 years. The organizations consolidated in the Lehigh Valley Railway Company were the Geneva and Sayre, the Geneva and Van Ettenville, the Buffalo and Geneva, and the Auburn and Ithaca. Long before the construction of its own line to Buffalo, while still reaching the city over the tracks of the Erie, the Lehigh Valley had begun immense terminal improvements, covering in all about five hundred acres of ground.